1 mL Insulin Syringe with Permanently Attached Needle BUY Safety Lok 1 mL Syringe, 1 mL Insulin Syringe with Needle, 1cc, 1mL, U-100 Syringe with Needle, 329464, BD Becton Dickinson Safety-Loc Insulin Syringe with Needle. 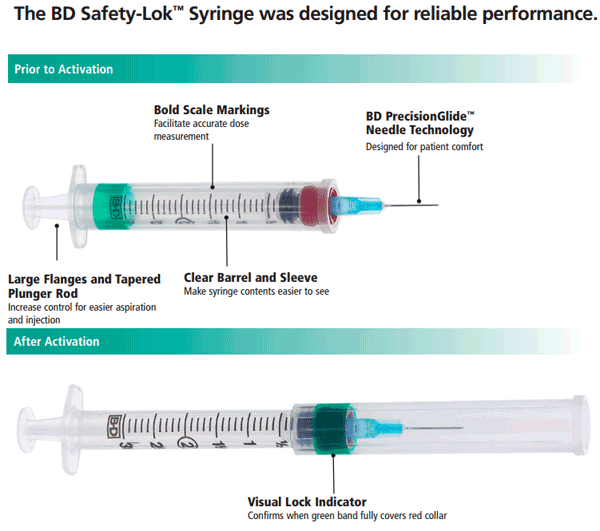 Safety-Loc Insulin Syringes with Needle by BD Becton Dickinson offer U-100 dosage for diabetes. 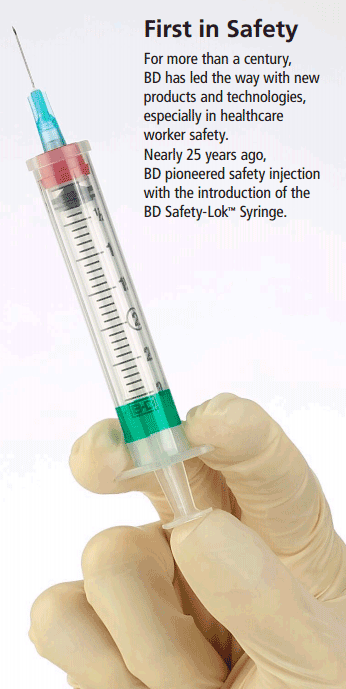 BD Safety Loc Syringes have a safety sleeve that slides over the needle after use to prevent accidental sticks. This Safety-Loc Syringe is equipped with an Ultra-Fine permanently attached needle made of stainless steel. The needles are regular wall and regular bevel to meet the needs of most diabetic patients. 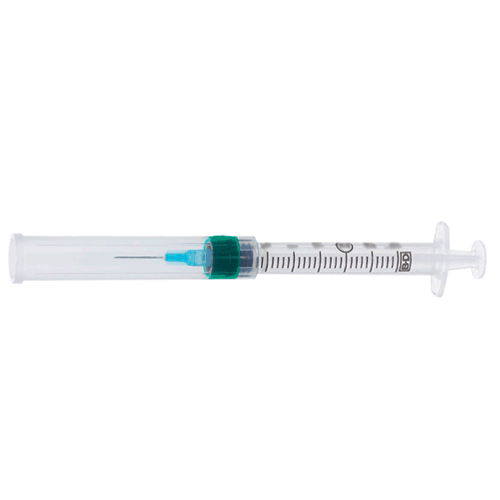 The syringe size is 1mL or 1cc and comes with a 29 gauge, ½ inch needle. 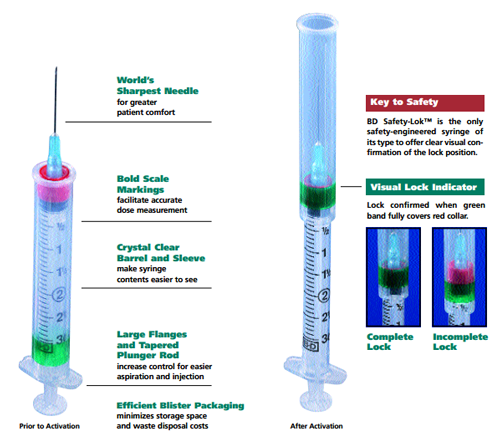 Safety Loc Syringes and Needles are sterilized with radiation, EtO. The Safety Loc Insulin Syringe with Needle comes blister packed. 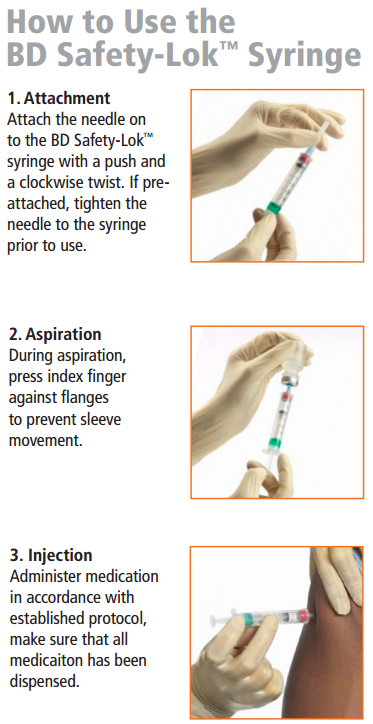 Syringe size provides easier handling and greater control. Permanently attached needle provides less dead space. Bold measurements clearly marked on the syringe barrel provide greater dosage accuracy. 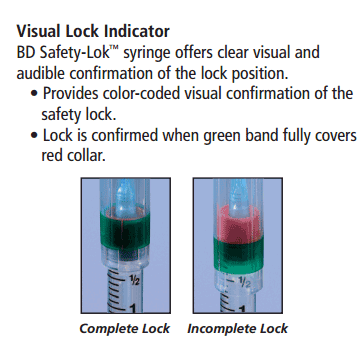 BD Safety-Loc Syringes and Needle Product ID Number: 329464. Syringe Volume Size: 1mL or 1cc. Needle Gauge Options: 29 Gauge. Needle Length Options: 1-1/2 Inch..
Needle Point Style: Regular Beveled Tip. Needle Attachment: Permanently Attached Needle. This was my first time ordering medical supplies for my son. Gilbert was the one that helped me with my order. I greatly appreciated his assistance and equally appreciated how quickly I received my order. About the specific product - it's a good quality syringe and needle combo. I received my shipment right away. The product was exactly what I ordered. I am very satisfied.